A technology that creates the fabric of the organisation by uniquely weaving people into the brand with tools that embed purpose and meaning. Give feedback, connect people, make employees feel they belong, and pull everything together in a way that Inspirze® them. 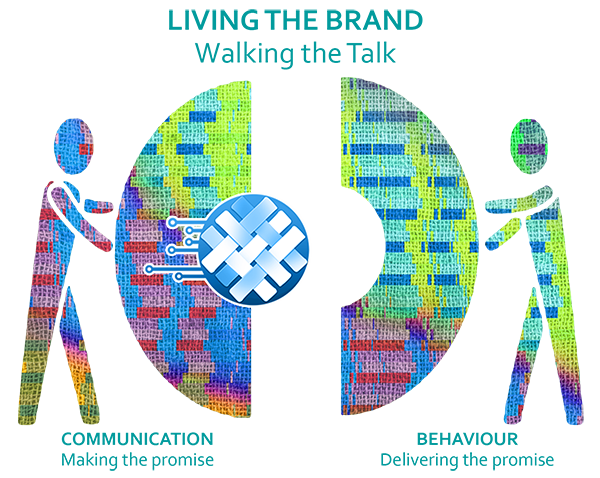 Inspirze® weaves Context Technology™ into the fabric of your organisation, touching everyone in a meaningful way and connecting employee and customer. This improves brand sentiment and customer satisfaction from the InsideOut, inspiring people and building trust. Inspirze® takes the aspirational brand story and threads it into your business operations, driving positive behaviours in your signature way of doing things. When this happens, customers experience it and employees feel it. At the core of Inspirze® is a contextual conversation platform that underpins the fabric of your business, incorporating your people into the brand design and story. Each thread embeds purpose and meaning, gives feedback, connects people, makes employees feel they belong, and pulls the organisation together. Connecting people to the brand story in a way that gives them a perspective on how they fit into the organisation and encourages them to deliver on the brand promise. Creating insight for employees on the impact of their roles on each other and the customer experience. Building relationship views that give employees insight into how other employees can assist in the journey to Live the brand. 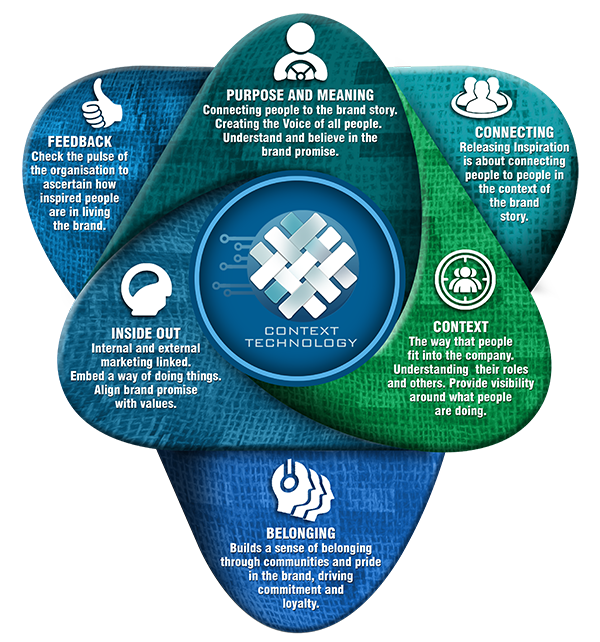 Weaving relationships, signature actions, information, training, and development in relation to the Brand story. Facilitating transparency by giving everyone a voice, allowing for an immediate view on the organisational journey, and flattening hierarchies on the way. Feedback loops allow employees to see how their contribution to the workplace makes a difference. Communities build an awareness that they belong. Self- awareness for employees around how their values and beliefs fit into the brand culture. Building the voice of all people, empowering the organisation to be transparent. Learning and development on tap to fuel growth. A place to focus on growth and development. External and internal marketing is seamless, building identification and understanding of the brand values. A shared understanding of why the Brand exists, and what it stands for. The organisation walks the talk and embeds signature actions in the day-to-day operations of the business. Connecting employees and customers to people who believe in the Brand story gives inspiration to both groups. The organisation starts from the “Why” and builds an InsideOut approach that encourages participation, inspiration, and advocacy.